Warburg School Classmates (1951-1963) celebrate their 50th Reunion: Front Row: Ivy (Kurley) Seely*, Bob MacDonald*, Selma Stobbe*, Caroline MacDonald*, Dwayne Skoye, Ervan Stobbe*, Lynda (McQuaker) Horvath. Second Row: Norma (Ladd) Durand, Elaine (Olson) Prenioslo, Shirley Blize, Howard Kelto, Fraser Hallan, Bob Lemermeyer. Third Row: Sharon (Gee) Rechner, Gladys (Nemeth) Meinczinger, Patricia (Kolt) Worshek, Lydia (Sabo) Reves, Josie (Heidt) Cygan, Nancy (Goldthorpe) Gruninger, Rita (Smith) Krawiec, Anna (Korbely) Tomko, Harvey Bentley, Andy Sabo. Back Row: Jane (Eyre) Wold, Gladys (Saubak) Tough, Vince Lemke, Jeanne (Roth) Szepesi, Leslie Nemeth, Clifford Broadbent, Dale Bredin, Ken Walters (hidden), Wilfred Hartfelder. Missing: Margaret (Wagner) Stevenson. * indicates teacher. 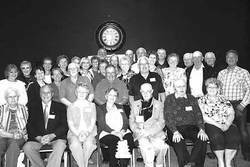 On May 25, 2013, nearly 40 former students of the Warburg School Grade 1 Class of 1951 met for their 50th reunion. Following the meet and greet, classmates, spouses, teachers, and guests boarded Reg Maltais’ bus for a tour of the current Warburg School. The tour was hosted by former student (and former teacher) Gladys Nemeth Meinczinger and Warburg School Principal Ian Drysdale. The classmates then went next door to explore their former grade 4 and grade 5 classroom in the building that is now the Warburg Museum. Those many memories were followed by a tour of the Village of Warburg before the alumni returned to the Warburg Cultural Centre where they were served a lovely dinner, catered by Pure Country Catering. Organizing a 50th Class Reunion can be a daunting task, but Anna (Korberly) Tomko, Lynda (McQuaker) Horvath, and Gladys (Nemeth) Meinczinger rose to the occasion, providing an excellent get-together. The classmates came from Warburg, Pigeon Lake, Drayton Valley, Stony Plain, Spruce Grove, Edmonton, Calgary, and British Columbia. Naturally, not all who started out together in that grade 1 class stayed together. Some students moved away after attending only one or two years, and new students moved in. When that high school graduation year finally arrived in 1963, Warburg School graduated seventeen students. A total of 68 people attended the event including several teachers—Bob and Ellen MacDonald, Caroline MacDonald, Ivy Kurley Seeley, Ervan and Selma Stobbe—and a few bus drivers—Harold Gulde, Ruben Schmidt, and Leeson Ruff–and their spouses. Special greetings were presented by Barb Brown, Assistant to Honourable Diana McQueen, MLA for Drayton Valley-Devon; Audrey Kelto, Council Member with Leduc County; and Dawson Kohl, Mayor of Warburg .